These basic symbols make up the majority of the abstracted head of Apollo on this Celtic coin. Note also that the symbol for the ear and eye are the same and also are reminiscent of a horses hoof and a crescent mood. The use of a symbol with multiple possible meanings or interpretations is common on Celtic coins. However, there are two more, less obvious compound symbols or abstractions on the Durotriges coin that need explaining. Whether the first compound symbol on the Durotrigenes coin represents the eye & brow or hair and ear symbol (the spike) is somewhat controversial. However, the famous large flan gold stater of the Bellovaci (VA12-1) suggests that the symbol likely represents the cleft in the hair and the ear of the Philip II silver tetradrachm, as shown below. 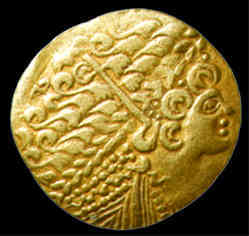 This image has been flipped to match Philip, the face normally faces left, though very similar coins facing right were minted by the Ambiani during the same period (VA10-1). Another gold coin minted by the Ambiani, the small flan gold stater (VA46-1) shows a similar spike extending from the part in the hair to the ear. In addition it appears that both ears are on the same side of the head as the eye since the nose and mouth can be seen clearly on this early gold stater from Northern Gaul. One wonders if Picasso derived his abstractions from the Celts.